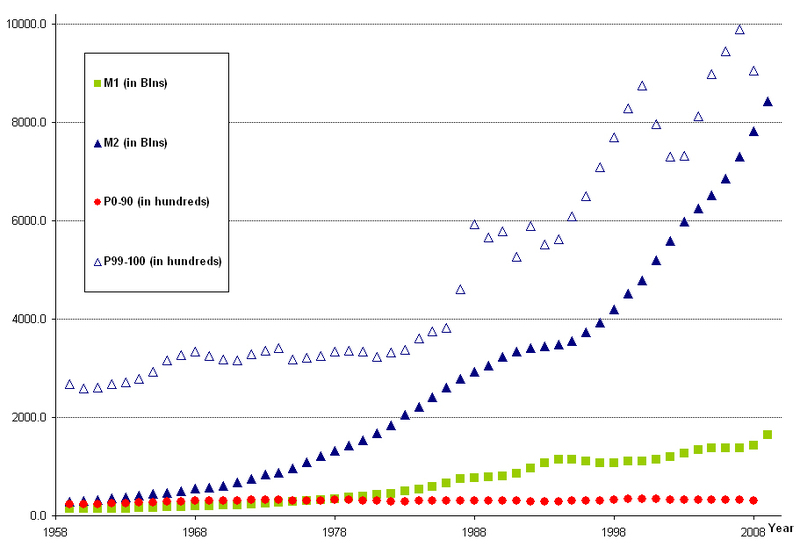 When money represents discrete fractions of actualized human potential adjusted for an instantaneous estimation of future productivity increase, to account for net outflow of money as the US trade deficit ballooned in a continual expansion of the US-dollar denominated market, more US dollars were necessary to fuel the “greater-US” market without either disrupting the US socioeconomy or experiencing dramatic domestic deflation. Money supply then would have to grow at the rate of productive population within the greater-US market (i.e., the domestic and foreign USD-denominated markets) adjusted for (an extremely near-term estimate of) productivity gains made by same (so to maintain full employment absent deflation). The Federal Reserve would furnish money sufficient to the task. But, it wouldn’t get used to the purpose. Because US workers were already highly paid relative to poor foreign workers, we would not expect US middle-class incomes to grow much as a result of greater-US market expansion (unless the creation/expansion of a greater-US market were to enhance productivity gains). And, as is clear in Fig. 1, US workers’ incomes remained relatively flat over the time period. But, if money were being used to purpose (i.e., to promote development of foreign middle classes) then we would not expect to see a rise in top-tier US incomes. But, we do. From approximately 1982, the top 1% of US earners saw increases that roughly corresponded to the increase in M2. In order to keep the US market competitive, poor foreign wages-per-capita would have had to rapidly approach US middle-class wages minus cost of transport (i.e., grow at a rate unsupported by the foreign-labor-pool-to-foreign-labor-demand ratio). Otherwise, poor foreigners would always out-compete US counterparts on a purely-cost basis. Absent extraordinary wage increases in poor-labor countries (and in the face of anemic foreign demand for their own goods and services—the result of low wages relative to the cost of the goods that they produce), the US (and parts of Europe) would have to consume the excess supply or give up creating foreign middle classes. Of course, as much as was prudent, US-made goods and services could be replaced with foreign-made. US jobs would be slashed en masse at every opportunity. Fear of the prospect of unrest would (generally) make that temporary. 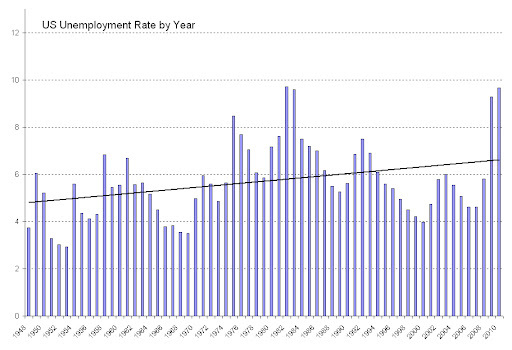 Still, the average unemployment rate in the US has crept ever higher in the post-war era. Needing domestic jobs but unwilling to pay foreign workers enough to buy the goods that they’d produced; or charge US consumers less for goods and services than the market would bear (i.e., produce domestic goods at a loss and foreign goods at a profit); or lavish cash (so-called “profits”) on the US population, US stewards had to find some way to effect purchase of the surplus goods produced. In the absence of real money to purchase excess goods, credit could be furnished US people. 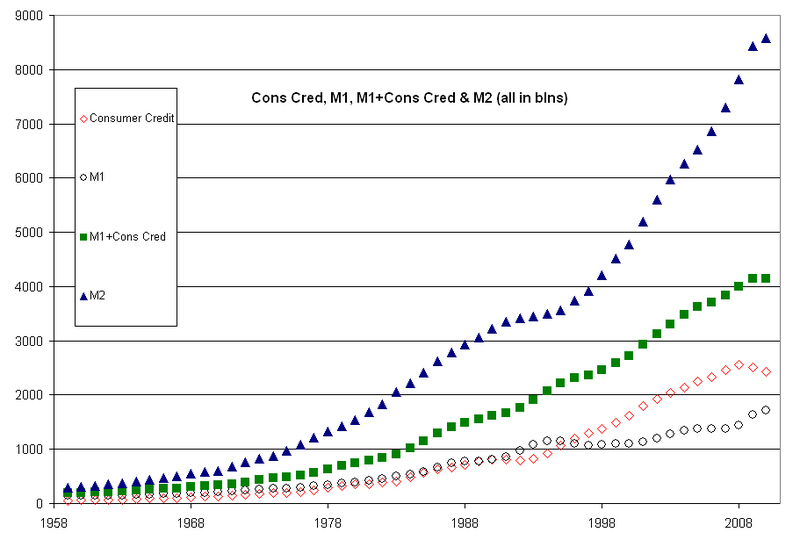 As of now, credit associated with “excess” production/consumption (which became a way of life) must still be repaid but bottom 90% incomes have not risen to meet the burden. More pointedly, it seems the world economy is dependent upon vanishing credit to purchase surplus goods despite plenty of fiat money for the purpose because top-tier earners have irrationally siphoned needed currency off the greater-US market. Absent meaningful change, the greater-US market will fail. Non-western middle classes will not develop. Global stability will continue to elude. And, even the fate of the US market is uncertain. Like “everything”, belief in freewill – the singular ability (generally attributed to “higher” animals and their familiars) to think, decide and act irrespective some inexorable extra-personal causative agent or agents (i.e., responsibly) – belief in freewill is over-determined. It just seems right; does it not? I think, decide, act and can “observe” myself as I do so. Intuited, as it were, observations of freewill originate within me. Why question it? Further, the concept of “personal responsibility” (i.e., the concept that I am master of my body and, therefore, uniquely accountable for its actions) is deeply ingrained and, generally, “works”. Application of the concept of freewill to life’s problems can and frequently does produce desired results. Yet, the concept is integral to western justice systems, which are (almost universally and in toto) justified by freewill, or, “personal responsibility”. The “justice system” is supposed to “hold” individuals “responsible” and “punish” them for their bad actions. (Not so “capitalism”, a justice system, itself, which does not seek to “hold” individuals “responsible” and “reward” them for their good actions but as aforementioned in Part I.) Henceforward, it would seem, to extirpate the concept could turn justice on its head. Moreover, it is often argued that, personal responsibility is the one best rational justification for productivity. And, this may be closest to home for many “successful” people [who (as it happens) either are or are not endowed by their creator with certain gifts] both social stratification and capitalism are virtually predicated upon freewill, without which (it seems) the socioeconomy could be imperiled. Besides, when we assume determined will, many of us reach distasteful conclusions. Do we disavow determined will on that basis? Some will understand “determinism” to mean that it doesn’t matter what a body does. This is patently absurd. Still, when we assume determined will the individual is reduced to a sentience, which can be neither more nor less blame- (or praise-) worthy than another – making the human experience just that. Paradoxically, it is only when we assume determined will that we have control over the universe: I must be causative to be cause. Personal and extra-personal control are mutually exclusive possibilities (as with black and white, up and down, left and right, ability and disability.) If we accept the former we disavow the latter and the converse. O, to be better by fine margins! How will we know who is best? We will fight. Winner, take all. Drop what you are doing for the competition. The first place finisher will get a gold medal ($953/oz. ); second place, a silver medal ($13.73/oz. ); third place, bronze (something greater than zero/oz.). Never mind how impossibly small the difference between first and third might be. Everybody else is worthless. Finito, Benito! It is the natural prerogative of winners to dispense with losers. But, winners cannot expect to lord it over losers when they are better by fine margins. And, they band together to defeat winners. An endless cycle of winners and losers. O, to exist in the natural state! Let us not accomplish anything at all. Why should we when we can ravage the cupboard? We will wear our balls hanging out and the women folk gather fruits and nuts; and, we will hunt within our domains.